Up about 9:00; the first thing I did after breakfast was to work on the bread—the bulk of the recipe had to be added, plus mixing, kneading. I put the dough into 2 bread pans to allow it to rise, then went off to other matters. I was concerned to get the letter to the Selectmen written—the one concerning the Project NUVA petition. When this was finished I turned my attention to getting the letter ready concerning pledges. I shaved after lunch. Peter Haskell came by to pick up the petition, and by midafternoon his mother came by with it—with a total of 50 signatures. I then took it down to the Selectmen’s office. Then I came home again and worked on the pledge letter. It was after 4 o’clock that I was finally ready to take it to the P.O. Debbie went with me. When we arrived home, Beck Bussey was also arriving—she stayed only a brief while. I had to go back to the P.O. in search of my fountain pen—which luckily was there. I helped with supper when I got home. Worked at my desk after eating—until 6:30—watched CBS news then. 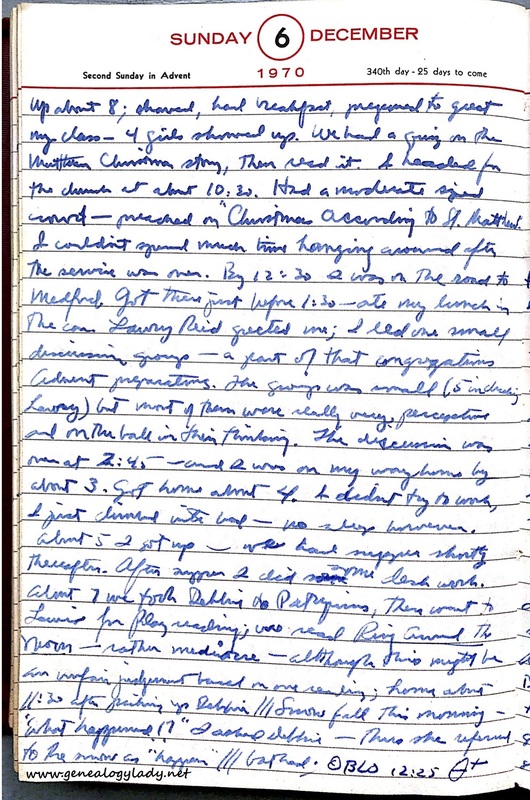 About 8:00 we went over to Lewis’s—wanted to show Carol the bread, which I’d baked between 1:00 and 1:45—we watched Ironsides + Odd Couple—shortly after 10:00 we headed home; desk work, also read a while in various things; OBLO 12:05. Up at 9:00. After breakfast was finished, Bonnie prepared to go shopping, I got to work on my sermon, i.e., revising one that is 2 years old. Debbie played in her room. The mail man brought a letter from David Watson, and the pictures, black + white, which I’d mailed in last Sunday afternoon. The bulk of this roll is to be sent to Esther Norwood in California. I made some progress on the sermon by the time Bonnie got home, shortly after noon. We had lunch, then she left for work. Debbie went down for a nap, I returned to work on the sermon. It was my main concern for the afternoon. I finished it in time to work on the bulletins; late in the afternoon I alternated working on the bulletins and working on supper. I finished them by the time Bonnie came home, and we ate as soon as she arrived. After supper I worked at my desk. I’d taken a break in the afternoon to write a letter to David Watson. I included 3 photos in it. After watched CBS news etc, I returned to work at my desk. Bonnie went off to visit with Carol Lewis and practice songs. She was gone til after 10:00. I got caught up on paper work and got my desk put in order. I also started another batch of bread—read some in Fanny Farmer about making improvements; bathed about 11:00. OBLO, read: LO, 12:10. Up about 9:00. Had breakfast, shaved (2 days worth), went to the post office with the letter to David Watson. When I got back home I turned my attention to the bread—the sour dough was rising during the night. I finished the recipe, kneaded, put in bread pans, put it on radiator. 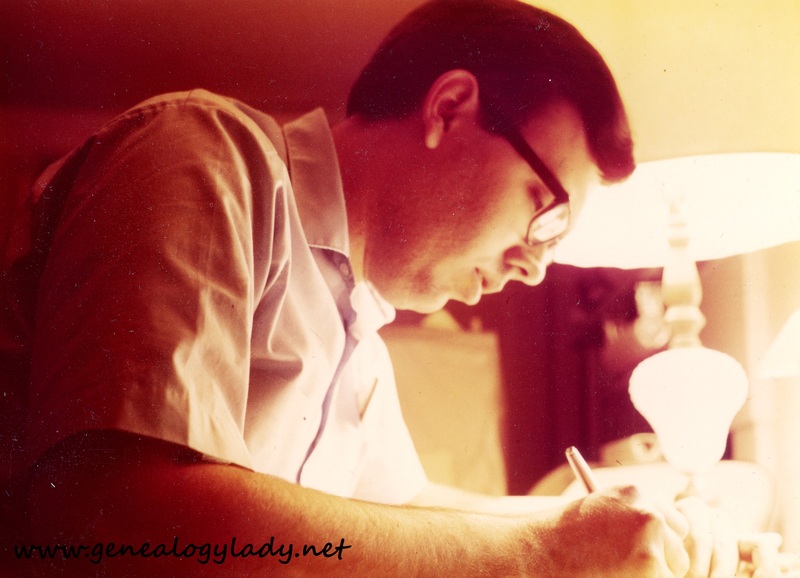 Then I turned to desk work—had several things to do—had to finish preparing the service, write comment re: stewardship and pledges; write Mrs. Myers; prepare for my presentation at Medford; prepare a quiz for my Sunday School class. I spent the afternoon working on these things—and into the evening. I put the bread into the oven about 3 o’clock—two more beautiful loaves. I worked on supper about 5:00—we had a delightful steak—and we introduced Debbie to eating by candlelight—she though that something was wrong. She made comments about the light being broken and pointed to the switch. We have angel chimes which tingle when the four candles are lit—so we ate most of supper with these going. During the evening we watched the Peanuts Christmas Special—and for most of this she sat watching the TV—Bonnie did some sewing (a cushion for the deacons bench), I work[ed] on Medford presentation, revised sermon ending; bathed about 11:00; OBLO c. midnight. This entry was posted in Genealogy, Yegerlehner and tagged 1970, David A. Yegerlehner, Deborah Yegerlehner, genealogy, Massachusetts, Methodist Church, Rockport on November 12, 2017 by Deborah Sweeney.